Homily delivered at the academy Keter Atalmidim by Jacob Gomez de Silva. Principio de sençiaTemor de / Deus / ראשית חכמה יראת ה‘ כתר התלמידים / Sermão /de / Principio y Fin / Pregado na Yesiba de Keter Atalmidim em Sabat Hanuca / y feito por / Yacob Gomez da Silva / No Anno 5477 / Amst[e]rdam. p. 5: Portuguese sonnet “Prinçipio Universal de toda a Sençia”. 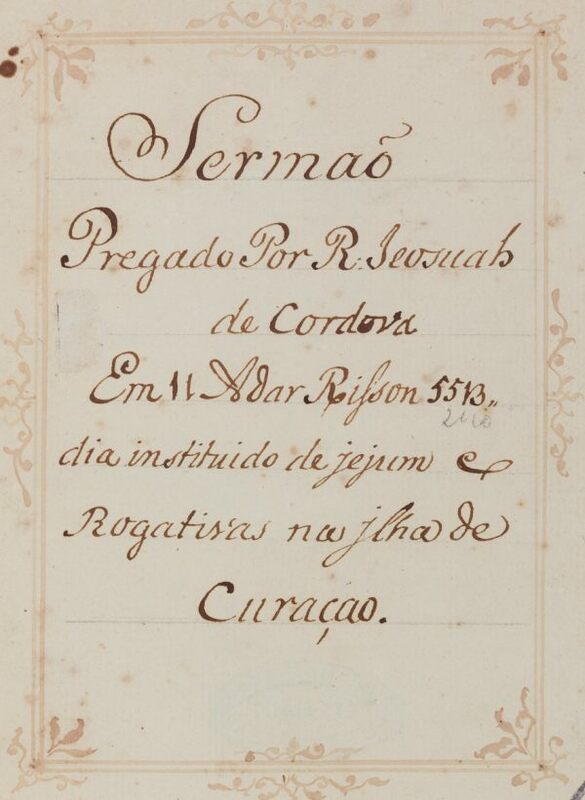 p. 6: Two Portuguese outavas, including an anagram with the name of David Mendes de Silva. p. 52: Latin quotation “Finis Coronet Opus”. p. 53-55: Decimas, Portuguese poetry by the author. Portuguese with some Hebrew quotations / Paper / 19,9 x 15,6 cm. / 55 pp. / 22-23 lines to a page / Current writing / Hebrew quotations in unvocalised square writing (autograph) / Title written in drawn frame / Catchwords at the bottom of each page / Bound together with another 18th century homily in modern linen binding. Fuks 19. Fundação Calouste Gulbenkian.